Let’s hear it for the fruits! Just in general, really, summer fruit has been stellar this year. I’m not thrilled with the temperatures this summer, but if it’s even partially responsible for the abundance of fruit we have, I guess I’ll take it. I’ve had more juicy, perfectly ripe fruit than you can shake a thermometer at, and although I’m looking forward to the fall when things cool off a bit and I can dig into root vegetables and leaf-collecting with the Wee One, I’ll miss the cornucopia of delicious fruits (and vegetables) this summer has brought me. A special thank you goes out to my garden, which has STILL not died in the heat. Garden, you’re the best. thank you for making me think, on our best days, that I could manage a modest farm. I couldn’t, let’s get real, but thank you for allowing me to feel like I could. Am I bidding farewell to summer? Not at all; I’m just recognizing it before I get caught up in the changing of the seasons. And how could I say goodbye, really, when today’s “cold front” brought temps only in the mid-nineties. It’s still summer, but I’ve been browsing through cookbooks and getting inspiration, I’ve started gearing up for fall. Unconsciously, but it’s started to happen. Take, for instance, this fruit selection. We have nectarines, plums, and – say what? – pears. It’s almost time for pears, people. That’s my first sign of fall, because perfect pears only come from early fall trips to the market. However, we must have some sort of freak early pear wave around here, because I purchased these knowing I’d probably have to poach them (my cheat to take pears from firm to just right), but I was happily mistaken. These pears needed no poaching. I was thrilled. Another fall thing for me? Ginger. I start to accept ginger back into my life as a regular addition to dishes sweet and savory alike. I like its warmth, its subtle bite, its way of turning normal meals into something a little special. Also, I’m a gingerbread/gingersnap/ginger-anything addict, so obviously ginger, in all its forms, makes a regular appearance in my kitchen. As luck would have it, I get three types of ginger going in these muffins. It’s like Fall 101: The Ginger Seminar. And ginger skeptics; take heed. Even though there are three types of ginger in this muffin, please do not mistake these for a “gingerbread” type end result. This is just ginger: gingerbread requires lots of ginger amplification from things like molasses, cloves, allspice, mace, the list goes on. Certainly if you still have doubts, reduce the ginger; start by reducing ground ginger, which is the most concentrated, by half. Still worried? 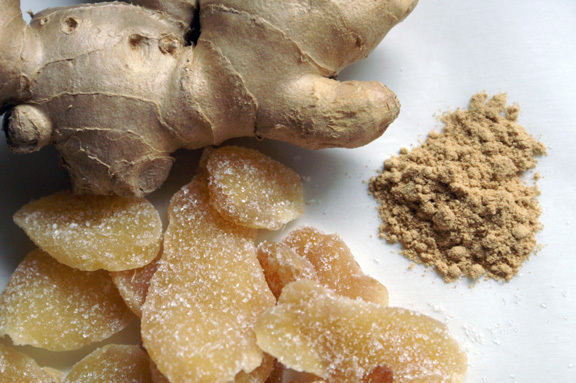 Cut down slightly (like from 1/2 to 1/3 cup) on your crystallized ginger. I would keep the fresh ginger as/is. If anyone is wondering, the crystallized ginger DOES taste like candy, and I did buy extra so i could snack on a piece here and there. It’s good for you. Now, about picking your fruit. The original recipe is a pear and ginger muffin, and that’s why it continues to catch my eye. However, with the onslaught of peaches, nectarines, plums, and so many other fruits right now which pair perfectly with ginger, I thought I’d give it a go with several kinds. I love muffins, but I wasn’t about to make three batches of these, so I simply made the batter, divided it into three equal-ish parts, and added different fruit to each bowl. You can do the same; or, if you feel like going fruit crazy, use a combination of fruit in the muffins. To denote which muffins were which (we’re very scientific around here, and also I thought it looked pretty), i topped each one with a slice of fruit corresponding to what was contained inside. Keep in mind that the juicier the fruit, the denser (and shorter) the muffin. 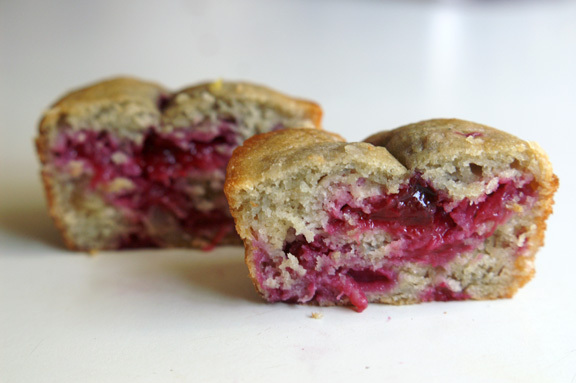 An increase in the juice factor seemed to be closely associated with how much these muffins poofed up. 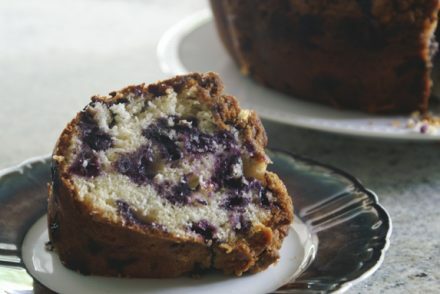 If you want to counteract this, add a few tablespoons more flour to the sections of the batter which have the juiciest fruits, or buy fruits which are ripe and flavorful but not overly soft. My pears were soft but not juicy, so they were the tallest. Conversely, my plums were so juicy I had trouble chopping them, so they were the shortest and densest of the three. The slice of fruit on top will weigh down the tops of the final muffins. 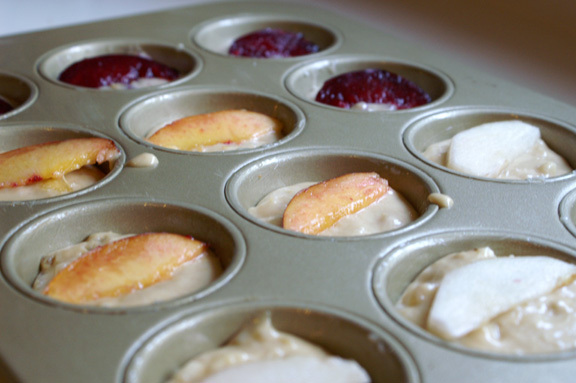 Below is an example of this using muffins from the same batch, the only difference being the fruit topper. 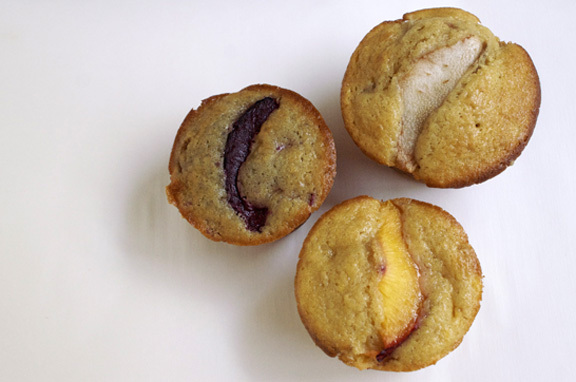 Obviously there are pros and cons to topping the muffins with fruit. It looks really pretty, but if you like a tall muffin, maybe that’s not the way to go. For tall muffins with a little something on top, opt instead for some additional finely chopped crystallized ginger bits. They look pretty, add a lovely crunch, and won’t weigh your tops down. These muffins are your muffins; they do not require a specific amount of fruit, nor do you have to go exactly by my instructions. I wouldn’t add more, but feel free to add less if you want a more ginger/less fruity muffin, especially for the juicier of the fruits. Take the plum muffins below: that’s using my listed ingredient quantities, and that’s a lot of fruit in there. For my money, that’s…well, money. But if you want less fruit, just consider the type you are using. You may not want to limit the pears, for instance, because they have a milder flavor and won’t have as much juice making its way through the muffins. Finally, enjoy these. I’ll miss summer, but I’m really looking forward to fall and all which that entails. Hopefully this is a nice late summer segue into cooler-weather flavors. Adapted from one of my eternal favorites, Williams Sonoma’s Essentials of Baking: Tips and Techniques for Successful Home Baking. *I made these using ginger only in the batter, and opted to not sprinkle any on top, instead opting for the fruit slices you see above. If you would rather top yours with crystallized ginger, reduce the ginger in the muffins to 1/3 cup and have another 1/3 cup finely chopped crystallized ginger on standby for sprinkling. **if you have a fruit you love with ginger, feel free to use it, keeping in mind it should have the same or similar textural qualities as the fruits listed above. You can, as I mentioned above, divide it into however many parts you have fruits for, or combine your choice of fruits together and make one combo batter; up to you. Also, don’t worry about being neat with your chopping; chances are some of this fruit will be difficult to cube exactly. I have zero issue with free-form chopping. Sheesh, enough already: make these muffins. Preheat oven to 400˚F. Butter a standard-size muffin tin (try to get the cups and the top, so the edges don’t stick) or line them with paper liners. It’s worth mentioning that paper liners change the overall texture and appearance of your muffin: they won’t have that nice little butter crust outside and they may not rise as high. Personally, I prefer the greased-muffin tin method. 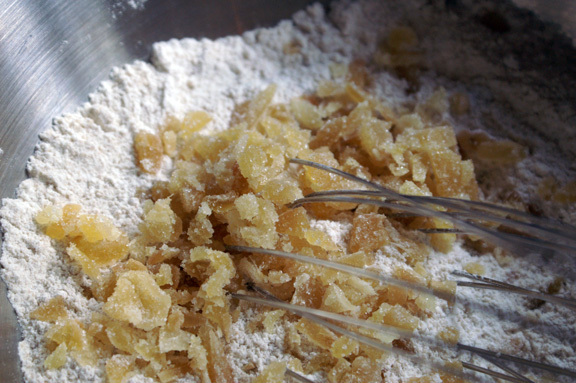 In a medium bowl, whisk together the flour, baking powder, baking soda, salt, ground ginger, and crystallized ginger. Set aside. 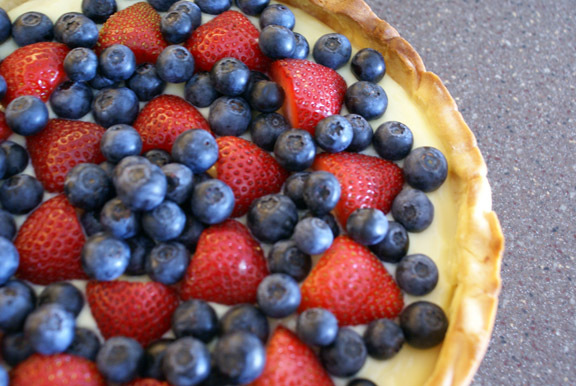 for multiple, individual fruits: divide batter as in as many bowls as you have types of fruit. Fold in fruit to each bowl, working until evenly distributed. for a singular fruit or multiple combination fruits: leave batter in your large bowl, and fold in your fruit until evenly distributed. Using an ice cream scoop, a small ladle, scoop your batter into the muffin tins, filling until they’re about 3/4 of the way full. 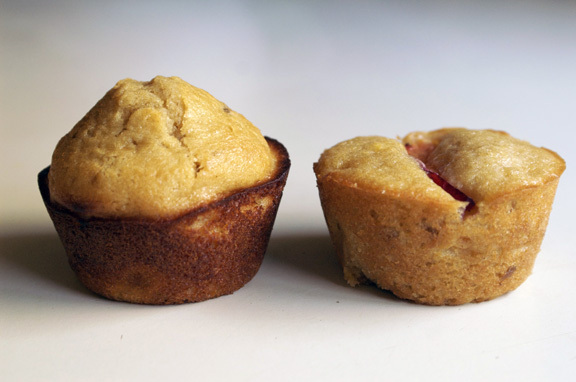 Bake until a toothpick inserted in the center of a muffin comes out just clean, 15-17 minutes. Keep muffins in pan on a wire rack for about 15 minutes, then remove from pan. These can be served warm (delightful) or cooled; I liked them both ways. The ginger seems to intensify slightly upon cooling, and even more after a night. 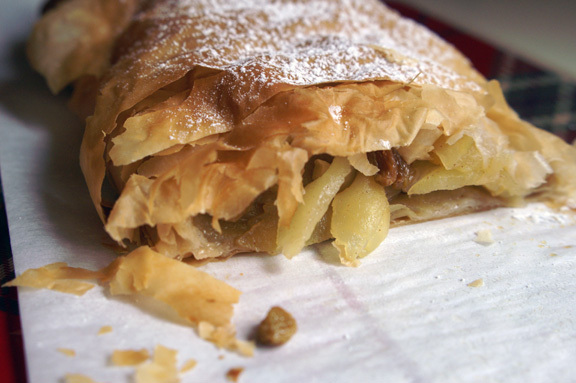 Tightly sealed in an airtight container, these should keep for 2-3 days, or you can freeze them for up to 1 month. Noooooooo don’t talk about fall yet nooooooo I love summer nooonooonoooo last night we noticed how much earlier it’s getting dark out and I wanted to cryyyyy but then I ate ice cream. Pretty pretty pick-a-muffins. 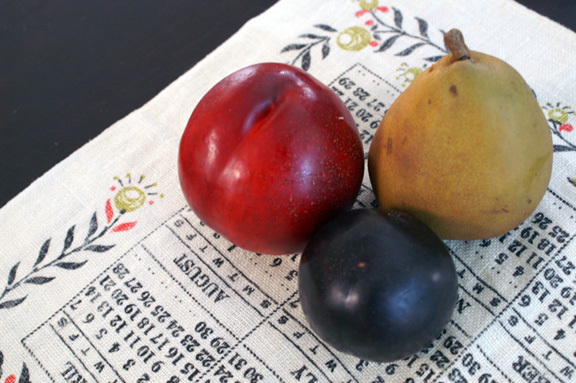 I love pluots… and pears… and plums… and nectarines…. and all fruit ever. oh no! believe me, me talking about fall won’t make it happen any earlier; if it did, fall would have been picking me up from the airport with a little sign which said “i’m HERE! welcome home!”. so in this case, wishing does NOT make it so. your tomatoes still have more time. bite your tongue about the heat, woman. it’s leveling off, and it has given me some ruby-red tomatoes, but i’d be fine if it went north. yes! and we will judge our fall/winter lives by how many tbsp of butter we consume per day. so says i! truer words were never spoken. and so it is decreed. So, a friend and I had this great conversation about Ginger the other day. And I told her I’m not a gingy lovah. This is crazy, but I’m almost certain I printed this recipe (or one just like it) from Willams-Sonoma’s website a few months ago. It’s been in the to-cook-soon pile far too long, along with their sweet potato and cinnamon crunch muffins. I’ll take your post as a sign to make these stat, along with some stone fruits. And the full complement of triple ginger, because I love ginger too. Thanks! Yay, fruit! And yaaaaaaay, ginger! I’d write more, but I have to go make muffins! And pick my fruit! Woot! i sincerely hope you are busy making the Beaucoup birthday cake. because um…i saw you post what you were making and i sort of booked a flight to halifax, soooo…if you could just send 2.0 to pick me up. and let me know what time you’ll be eating it. also i wouldn’t mind becoming an honorary Beaucoup, so if you could hold some sort of vote for that. Omg I love fruit filled muffins. These look absolutely heavenly!! julie, me too! muffins are my thing, and I wish i had the metabolism to just eat a big one for breakfast every day; i’d be totally happy. Alas, i don’t, so i save them for special occasions when i feel like treating myself. Somehow these ones didn’t make me feel so guilty because they really are packed with fruit. 🙂 thank you! farmers’ market monday: sweet corn gelato.